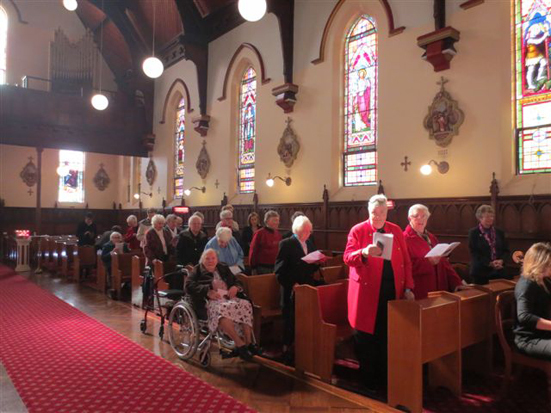 Since 1997 the Congregation has used the vigil of Pentecost to reflect on the work and importance of our ministries. 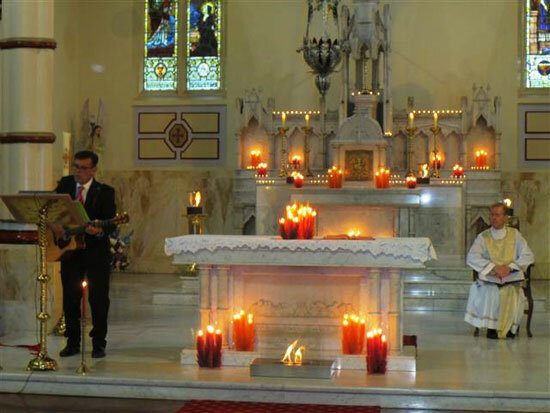 The theme for this year’s Mass was 'The Fire in Our Lives'. A diverse range of people who have worked with or have a connection with the congregational institutions and ministries—such as Monte Sant' Angelo, The Mercy Foundation and women who formerly belonged to the Congregation— were in attendance. The Principal of St Thomas Aquinas Primary, Springwood in the Blue Mountains, Sergio Rosato, gave a special reflection. This year Sergio was named Blue Mountains Citizen of the Year for the courage and leadership he showed in evacuating 500 students during the bushfires in October 2013. Sergio and his staff walked the students to safety as fire threatened the school site. Sergio’s powerful words helped us to reflect on the way in which the Mercy Values and the Holy Spirit guide us in our work for compassion and justice. 'As we walked towards our safe destination, we could see, hear and smell the chaos – emergency service sirens, helicopters flying overhead and the ever increasing plume of fierce-looking smoke that seemed to be carving its way through the bush and our local community, obviously, devastating all in its path. Once we got to the shopping centre we huddled together inside just like we had in the hall and waited for the day to take its course. I remember preparing myself to deal with the possible loss of life. Later that night when the chaos had subsided somewhat, it was safe for us to be transported from there to be reunited with family and friends. I firmly believe that on that day the Holy Spirit guided us and protected us.